We all know that sometimes it can be difficult to get your kids to eat the food you make, but animal faces toast makes it easy. That doesn’t mean you need to cater to their every whim all the time, but it is helpful to have a few tricks up your sleeve when the most dire situation strikes. 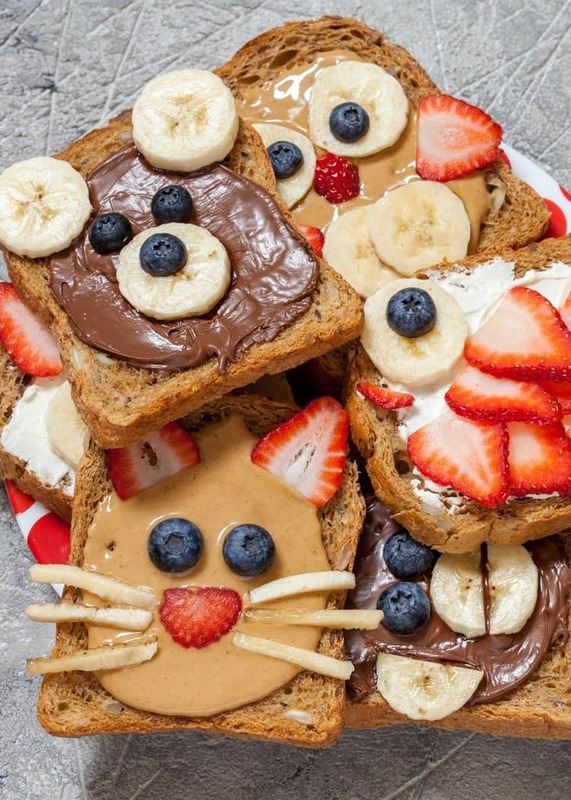 That’s why we love these animal faces toast ideas. They are fun, easy to replicate and you can have even more fun with them by coming up with new ideas of your own. You might like to serve these alongside our yummy Hot Fudge Sauce with fruit or Fruit and Yogurt Kabobs. Both are fun ways to get more fruit into your child’s diet. The more often you provide your kids with fun food choices that are healthy, the more likely they will be to fall in love with the taste of healthy food choices. Kids love to be entertained. It’s a fact. They also love the little details that you put into their snacks and lunches. Even today, with my own daughter well on her way to being grown up (okay, so we still have most of the high school years ahead of us) I still show her I care when I make her special lunches. And yes, the debate can commence–at what age should kids/teens start making their own lunches. Here’s the thing. My daughter is perfectly capable of making her own lunch and does sometimes. But, I have the time in the morning and I like to make sure she is getting a healthy lunch. So, there is no injustice in that, right? Yes, I’m making it easier on her, but kids these days or so crazy busy that I think it is perfectly okay to help them out here and there. If she were a completely irresponsible girl who needed a few lessons in accountability, the story might be different. So, while I don’t pack these fun animal faces in my own teen daughter’s lunch box, my family has spent years playing with food. We are staunch supporters of the play with your food movement. Okay…it might not literally be a movement, but you’ve seen all the fun bento box lunch ideas, right? There are so many creative lunch recipes and it seems like just as many fun bento lunch boxes. We can all be stylish with these! And really, if making fun food like this brings a smile to your child’s face or that crazy fun laughter that makes you smile inside and outside as you watch them enjoy life…isn’t it all worth it? That little extra time you spend doing something special for your kids doesn’t have to be time consuming. Seriously. Look at how easy these faces are to make. A little nut or peanut butter spread and a few strawberries or bananas sliced up and you’re good to go! I love discovering fun new ideas for making lunches. Whether you’re searching on Pinterest, Facebook, cookbooks or elsewhere, there are so, so many fun ideas out there for making fun interactive lunches. There are even YouTube videos (and channels) on the topic. I found some really great books that have such fun lunch food ideas in them. Can you begin to imagine how special your child would feel if they opened up their lunch box at school and discovered that you made something super fun for them? I’m all for the quick and easy, and morning rushes at our house certainly qualify for taking the easy route to lunch packing sometimes, but adding a special lunch here and there is a great idea! There are so many special lunch ideas you could create, starting with animal faces and going as far as your imagination and research takes you. Whether you’re making a bear, a mouse, a fish, a cat or a dog–or something else entirely, have fun with the simplest of ingredients. 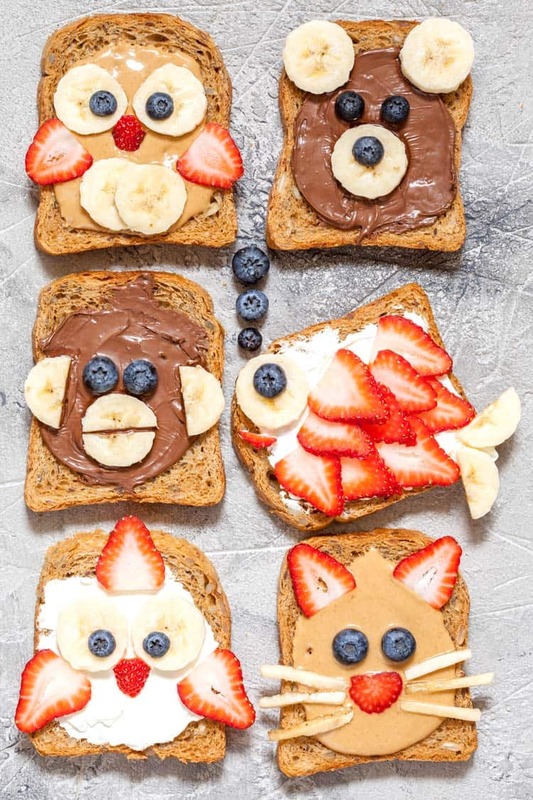 All of these simple animal faces toast ideas are made with ingredients you likely have in your own kitchen on a regular basis. Which is awesome, because not only are these snacks or lunch ideas super fun and easy to throw together, they can also be made out of ingredients you already have on hand. You’ve just saved yourself a trip to the store! Nutella, cream cheese, and peanut butter are the bases for all of these toast ideas. You could also use other types of nut butters. Then, slice up bananas, apples and strawberries for the shapes needed for these fun open faced sandwiches and you’re good to go. Toss on some blueberries, which always make fun eyes, and you have an animal toast creation fit for a king. Um…kid. It’s true! Playing with your food is fun! Seriously. Every time I’ve played with my own food to get creative or whatever–it’s been fun. There is just something refreshing and youthful and playing with food and being creative in the kitchen. It’s a must try! 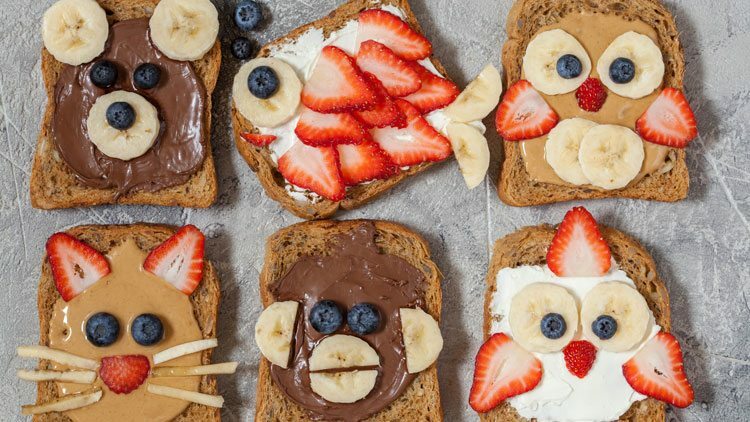 Whether you want to make panda toast, puppy toast or monkey toast, just get creative. Play with your food! Being creative in the kitchen, especially with children, encourages positive growth in so many ways: first with leaning how to make food; secondly, creativity encourages learning; and third, creating fun food together in the kitchen is the perfect platform for building a trusting area for open conveyance. If you start early enough, building an early shelter for communication is something that you can lean on for support as your kids grow older and into their tween and teen years. 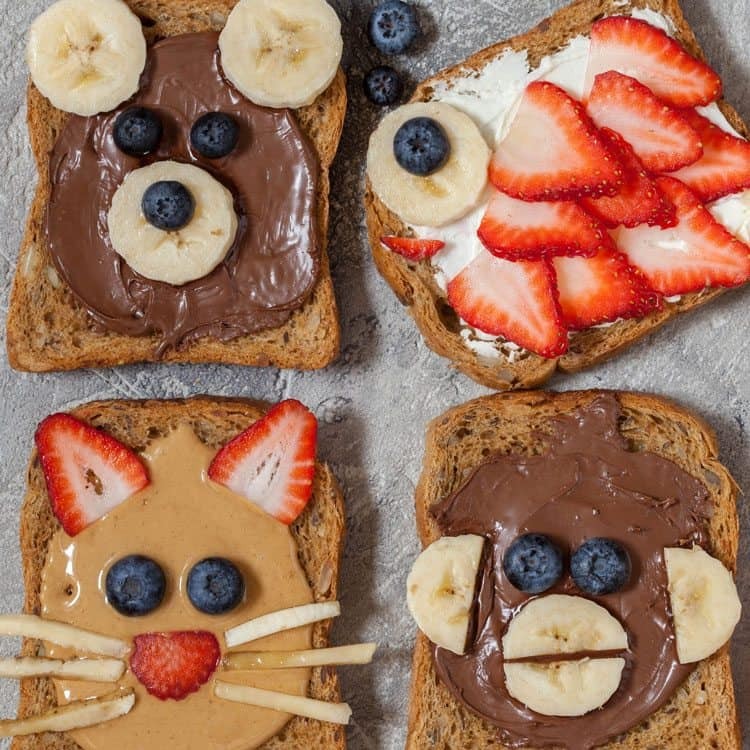 Making food fun for kids is easy with these animal faces toast ideas. Funny animal faces toast treats are even more fun when you create new ideas. Spread either nutella, cream cheese or peanut butter over toast. Cut banana and strawberries into appropriate shapes to mimic the animal faces in the photos. 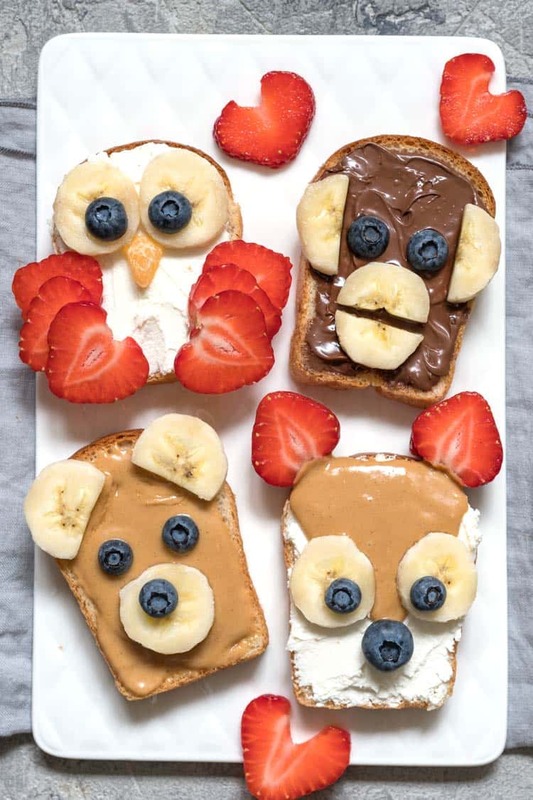 Add some blueberries for eyes and serve these animal faces toast slices up to the kids! What a great idea for kids of all ages…just in time for Spring Break too…Thanks!!! I don’t know if you were involved in the process, but I thought you should know that Buzzfeed put up a tutorial identical to this a couple of days ago on their Tasty channel. Great! My child will love cutely toast like this. Thanks for your recipe!